All of us must confront unexpected changes throughout our lives. Our response to these disruptions is often determined by how we perceive the changes. If we view a change as a threat, we may react defensively and take immediate action to protect ourselves, our perceptions or our comfort zones. If, however, we see the change as an opportunity, we may be more thoughtful and reasoned in our response. In that case, we may postpone action, continuing in our established routines as we wait to see how the situation plays out. Your business organization is no different. When a company faces a major disruption in its markets, the way its managers perceive the disruption influences how they describe it to the rest of their organization, which, in turn, determines how the organization responds. If the organization sees the disruption as a threat, it may overreact by committing too many resources too quickly. But if it sees it as an opportunity, the organization is likely to commit insufficient resources to its progress, especially if business-as-usual is truly the desired outcome. In our personal lives we have witnessed retail moving from storefronts to websites, which essentially changed how we shop. The car, as we know it, is changing in both the energy sources that it uses and in the way that consumers view transportation. Autonomous vehicles, in particular, will change how we view the necessity of owning a personal car, not to mention how we adapt to the fact that these vehicles will be moving, stopping and changing lanes around us with no one behind the steering wheel. Disruptive technologies in metal-stamping plants and tool-and-die shops impact business operations in similar ways. Examples include radio frequency identification (RFID) or Bluetooth communication for die tracking; dunnage rack and material transfer cart tracking via high-frequency and ultra-high-frequency communication technologies; the use of industrially robust RFID systems for die shut-height validation; and new mechatronic systems for monitoring progressive-die processes as well as value-added in-die validation and error-proofing. Here’s another: Rapid die-change technologies employ remote energizing/information transfer via wireless couplers on transfer dies and in progressive stamping dies. 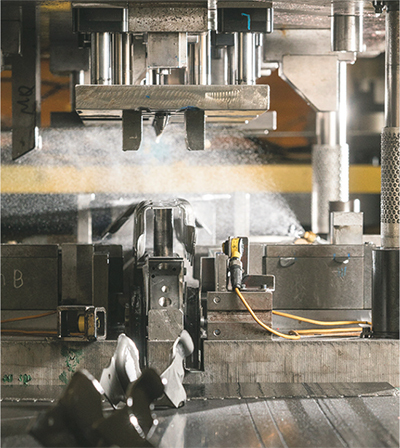 Automakers have used advanced high-strength steels (AHSS) for nearly 20 years, with ultra-high strength metal stampings now produced through cold-working and hot-stamping processes. More than 200 grades of automotive grades steels currently reside on the market, with at least another 80 in development. Compare that to the seven grades of automotive grades available in the 1970s or the 20 grades available in the 1980s—the two decades when most of our tool-and-die and other skilled professionals were trained. Tool-and-die shops face increasing pressure to shorten leadtimes and optimize die designs while reducing errors. Material loss in stamping operations generates one of the largest recurring costs in the manufacturing process, and reducing waste is paramount to controlling production costs and increasing profitability. Modern computer simulation technology allows tooling professionals to more accurately predict blank size and optimize layout within a coil. This must be accomplished early in the planning stages and then further optimized using process-planning tools to define the process and validate through simulation. Simply achieving green (safe) simulation results no longer can be the objective for today’s die engineer. Processing aluminum stampings requires a different approach than that for steel stampings. While most aluminum sheet alloys are cold-formed, some difficult alloys benefit from warm-forming and hot-stamping processes. These technologies, once limited to research labs, have emerged as viable forming processes. Both cold and hot stamping require tool-steel selection criteria and best practices for forming, trimming and piercing of AHSS grades. A difficult decision arises in choosing the right tool steel for either application. Factors affecting such a decision include: steelmaking practices, grade characteristics, heattreatment processes, tempering temperatures, microstructure, surface coatings, and the impact of manufacturing practices on the tool performance. Long gone are the days when we simply decided between 0-1, A2 and D2. Tool-steel surface treating for large automotive and appliance tool steels may benefit from controllable electromagnetic hammer heads that impart rapid reciprocal motion of a striker ball against the die surface—a process known as machine hammer peening. The process may eliminate manual polishing in dies and molds; improve wear resistance by increasing hardness in the surface layer; reduce friction in deep-drawing applications; and potentially eliminate secondary processes such as heattreating, coating and nitriding while improving others. Testing and comparing various metalforming lubricants can be time-consuming and risky to production tools. Most new lubricant formulas are based upon wet bench chemistry, not on actual field trials in an actual tool. Manufacturers can take advantage of standardized cup-draw test tooling to evaluate results for a variety of trial lubricants and sheetmetal substrates. This may prove an especially important step in lubricant selection for companies processing various grades of AHSS materials. Test results can show correlation to real-life press applications, thus limiting the risk to actual tools. Real-time and nondestructive production-monitoring tools have been widely used for various manufacturing areas such as joining and fabrication. Today, these tools monitor and assess incoming coil properties, blank surface finish/lubrication, die stresses, part temperature and final stamping quality.